We just love what Poncho is putting on the ground. We've tested him across a wide range of phenotypes and we are getting consistent quality and his phenotype. Que Lita's 2013 Poncho cria, a female named Kaiya, is gorgeous. 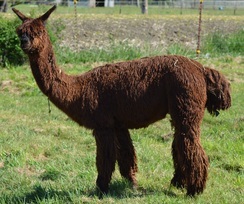 Zara's 2013 Poncho cria, a male named Zaliki, looks like he's headed for the big shows. RAV 10's 2013 Poncho cria, a male named Cancun, is a beautiful male with a calm demeanor. Pocho is definitely one of those Macgyver sons who is delivering the quality on a very reliable basis. Poncho Villa is a real asset. For discerning breeders who are looking for true black, this male has FABULOUS fiber stats. His a gorgeous male. Let us know if you'd like to come see him, and watch for his babies at the shows! Poncho is co-owned with Windrider Suri Ranch. They say that when selecting a dam, look at what she is producing. Que Lita is the dam of Eldora's Que Bella, the 2013 Futurity Champion Multicolor Female. You can't get much better than having produced a Futurity Champion! Que Lita's 2013 cria is a gorgeous deep red famale named Eldora's Kaiya and she looks very promising. 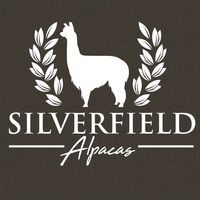 Que Lita's new owner has chosen Eldora's Frisco Gold as service sire for her 2014 cria. Let's hope these two produce another Futurity Champion!